It soon became apparent that if I wanted to fill my tag more frequently, or with a higher quality animal, a change was needed in my approach. When it comes to hunting big game, there are as many recipes for success as there are hunters in the field. The same is true for upland game and waterfowl. If you don’t believe me, just sit around the campfire in a hunting camp and listen to what is shared. Among the tall tales, you will find knowledge and wisdom scattered in the exaggerated details of hunting adventures gone by. Some of those recipes have been handed down from one generation of hunters to another. Some have been learned by reading about the exploits of others, or by watching them unfold on the internet. And some are learned through trial and error. In my younger days, I had a rather simple approach to deer hunting. Cover as much ground as I could in a day while stopping periodically to look at my surroundings. While I did manage to fill tags that way, a successful hunt was dependent on making a buck nervous enough to jump from its hiding place yet close enough that I could still make the shot. In many ways, that approach was not unlike hunting for quail, which is how my hunting career began. So, looking back, it was only logical that I apply what I already knew to my big game hunting experience. Still, it soon became apparent that if I wanted to fill my tag more frequently, or with a higher quality animal, a change was needed in my approach. That change came after a midhunt discussion with my brother-in-law about an article expounding the virtues of learning how to use binoculars to find more game while putting fewer miles on your feet. Though foreign to my way of doing things, the concept sounded reasonable. But since it required spending time on one’s backside, I wasn’t completely sold. Nevertheless, I studied the article and began to implement some of the principles from the story. 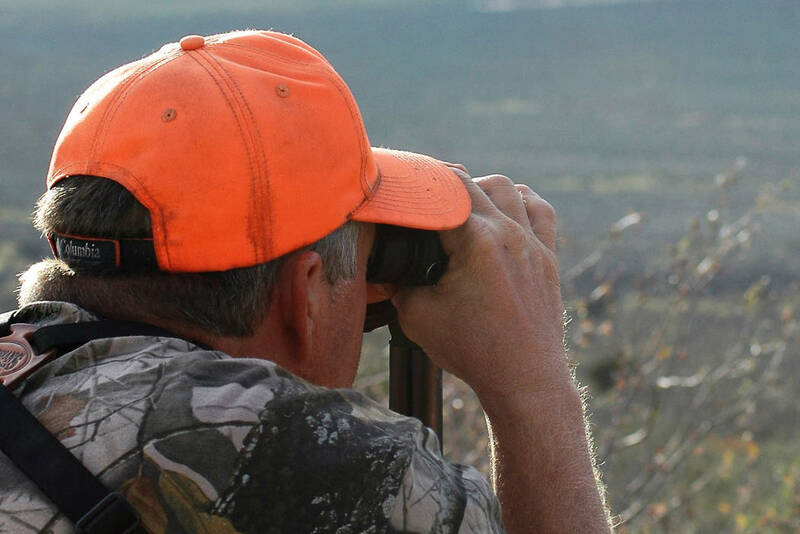 Through the years, I have developed my own recipe for hunting success, but rather than covering as much country as possible, I now spend a significant amount of hunting time on my backside with binoculars in hand. Since adopting that approach, I see more animals and shooters among them than I did using my legs. Naturally, there is more to using your binoculars than looking through them. You need to have a plan. First, begin with binoculars having magnification suited to the terrain you hunt. In a location where distances are relatively short, or the vegetation is thick, a 7- or 8-power binocular might be enough. In Nevada, 10-power glass is more appropriate, and some prefer 12. Keep in mind, however, that the more magnification you have the harder it is to hold the image still enough to benefit from the extra magnification. I prefer binoculars in 10 x 42. Second, start your hunt day in a vantage point that permits you to see as much country as possible and within the visual capability of your binoculars. Plant your backside in a comfortable place and commit to sitting there for a while. Third, use a systematic approach to glassing, or looking over the landscape in front of you. I begin by doing a general scan of the terrain from left to right and back again. Look for little pockets of cover or depressions where the game you are pursuing might hide from view. Next, break the terrain up in a grid comprised of smaller squares. I begin at the lower left side of that grid and move to the right until I reach the end. Then I move up one row and from right to left. Be sure to spend as much time as needed glassing each of those squares to be sure nothing is there. When that is done, start over and do it all again. While it’s nice to see an entire animal, you often are looking for the flick of a tail, the glint of light off an antler or the wiggle of an ear. Start by looking for anything that looks out of place. That could be a color, a shape or a movement. With practice, you will develop the eye for spotting game. The Nevada Department of Wildlife and the U.S. Fish Wildlife Service will host a free waterfowl hunting seminar from 8:30 a.m. to 1:30 p.m. Sept. 15 at the Clark County Shooting Complex Education Center. Sign up at register-ed.com/events/view/128031. Freelance writer Doug Nielsen is a conservation educator for the Nevada Department of Wildlife. His “In the Outdoors” column, published Thursday in the Las Vegas Review-Journal, is not affiliated with or endorsed by the NDOW. Any opinions are his own. Find him on Facebook at @dougwritesoutdoors. He can be reached at intheoutdoorslv@gmail.com.